Sally Pirkis was introduced to jewellery at Dartington, but went on to study interior architecture at Kingston and environmental design at the Royal College of Art. She continued her jewellery making at adult education classes while pursuing her career in corporate interior design in London. After moving to Suffolk and being awarded a government enterprise grant she set up as a jeweller in 1995. “Having always found pleasure in making things, I find it a great relief to be working with head, hands and heart to express my whole self. Striking out in a new discipline can be both stimulating and frustrating, but the driving force is my continual need to develop and refine the creative and technical input. Music, architecture, and 50’s textiles together with the European abstract painters of the early 20th century have inspired my latest work. Crisp, delicate, quirky images, cut from strong geometric shapes of softly shimmering matt silver, contrast sharply against the hard glint of highly polished edges. Recent designs, incorporating semi - precious stones have introduced yet another dimension of colour and luxury to her work, and the sensitive combination of imagery, composition, form and texture give this innovative, beautiful jewellery a distinct contemporary feel. 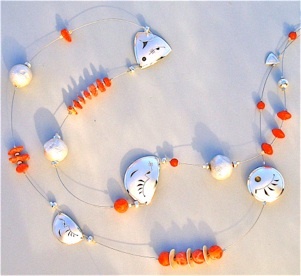 Sally’s latest versatile and highly wearable range includes earrings, pendants, neckpieces, cufflinks and bracelets.